Figure 20.3. Disease-specific survival of MM patients according to abnormalities of baseline sFLC κ/λ ratios, serum albumin or β2-microglobulin as used in the ISS. Group 1 (blue): lower than median involved/uninvolved sFLC ratio and ISS stage I or II; group 2 (red): either higher than median involved/uninvolved sFLC ratio or ISS stage III; group 3 (green): higher than median involved/uninvolved sFLC ratio and ISS stage III. (Courtesy of M.C. Kyrtsonis). Figure 20.4. Risk stratification model using the ISS combined with κ/λ sFLC ratios. Three risk factors were: abnormal sFLC ratio (<0.04 or >25), high serum β2-microglobulin (>3.5 mg/L) and low serum albumin (<35 g/L) . In current myeloma practice, patients are categorized at presentation using the ISS, based upon serum albumin and β2M measurements alone . Kyrtsonis et al. found that within each ISS stage, patients with an elevated involved/uninvolved sFLC ratio (>median) had reduced survival compared with those with less elevated values (<median). Furthermore, by combination of the ISS with sFLC ratios it was possible to divide the patient population into three groups with clearly divergent disease-specific survival (Table 20.2 and Figure 20.3). Table 20.2. Disease specific survival (DSS) in 207 newly diagnosed patients with MM according to the combined sFLC κ/λ ratios and the ISS comprising serum albumin and β2-microglobulin . (Courtesy of M.C. Kyrtsonis). Snozek et al. used extreme κ/λ sFLC ratios (<0.03 or >32) as an additional risk factor to those of the ISS (serum β2M >3.5 g/L, serum albumin <35 g/L) to separate patients (n=790) into four groups with 0, 1, 2, or 3 risk factors. These groups had median overall survival of 51, 39, 30 and 22 months, respectively (p<0.001). Because these data provided additional outcome information, it was suggested that sFLC ratios should be incorporated into the ISS to provide a new risk stratification model. In a study including 122 Chinese MM patients, Xu et al. used similar κ/λ sFLC ratio boundaries (<0.04 or >25) to add a third risk factor to the ISS. 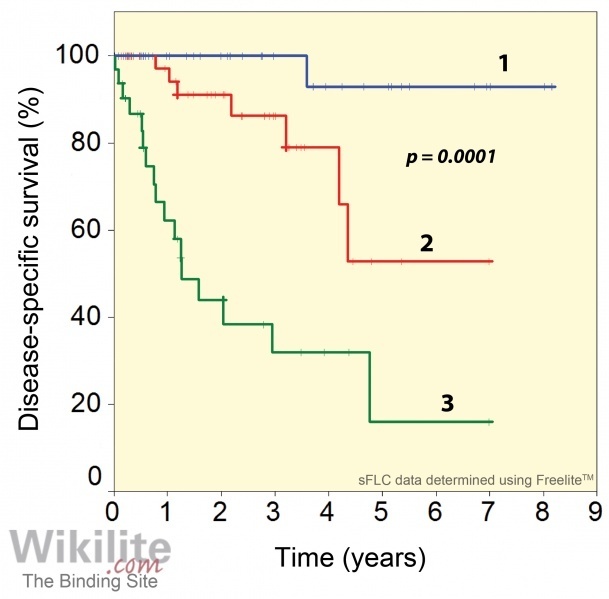 This produced four patient groups with clearly separate survival curves (Figure 20.4) and the authors again concluded that the prognostic potential of the ISS could be improved by incorporating sFLC ratios. Further evidence of the independence of sFLC ratios as a risk factor was provided by Esteves and colleagues , who used abnormal κ/λ ratios (<0.03 or >32) to separate patients within the ISS stage II (but not stage I or III) into groups with different overall survival. Whereas a study by Meddour et al. used the same cut-offs to further stratify ISS stage III patients for overall survival.